AMDA alumnus Stefan Blomquist came to the AMDA New York campus all the way from Sweden to study and become a performer. After graduation, Stefan went on to pursue photography and then film. He formed his own production company, IDA, with two fellow AMDA alumni. 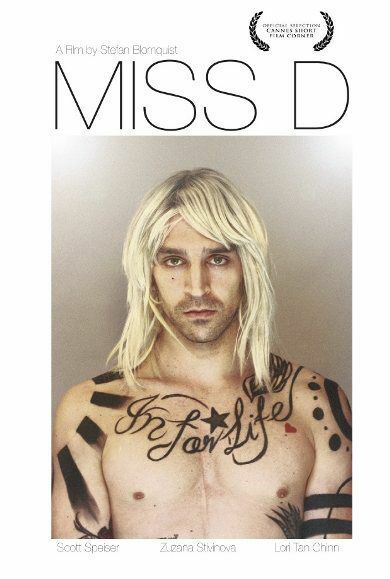 Their first short film, MISS D, will premiere at the Short Film Corner at the Cannes Film Festival. We spoke to Stefan just as he arrived at Cannes to ask him how he made the leap from performing to making films? What was your experience at AMDA like? Overall I had a great time at AMDA. I grew both professionally and personally. AMDA is the kind of school where you get exactly what you put into it, and even though after I graduated and moved on towards still photography and eventually filmmaking I still apply much of what I learned at AMDA. The basics of what it means to be an artist in any field. What was the most important thing you learned while you were at AMDA? With the risk of sounding a bit cliché, the most important thing I learned is that no one else but yourself can get you to where you want to be. When you graduated what were your goals? First I wanted to enjoy New York, and actually get to see the city that I had spent the last two years in but never really had the time to explore, and then of course succeed as an artist. When did you decide you would make your own films? I’ve always loved the motion picture industry, but I think it was a few years after I graduated that I started to fool around with the idea of turning my still photography into moving images. I’ve been obsessed with traveling ever since I was a teenager and every year I travel to some new places in the world and I originally thought that I had a calling for documentary filmmaking, then at the New School I started to dive into some creative writing and found that I can combine my love for the characters I meet/create and the aesthetics of them and their surroundings by making my own films. Is MISS D your first film? Yes, it is my first narrative non-experimental film. Tell us about the story and the inspiration for MISS D? The film opens on the countdown on the eve of New Year's, 1995. Miss D, a modest transvestite slinks home to her studio in Chinatown as the day breaks. She lets her answering machine play as she recomposes and recovers from the night before. D is startled upon hearing a voice message from her ex-lover Gina and causes commotion. Enter Ms. Ling, D's Chinese neighbor and landlady. Ling agrees to offset D's rent in exchange for herbs and consoles D as they unwind together in an empty bath. As Ling warns D of her ex's selfish ways, the phone rings. Gina is in town. D must decide whether to fall back or break free of the destructive pattern. I’ve always been fascinated by the transgender community and when I started to write I realized how little other people actually knew of the difference between a transvestite, a transexual and a drag queen for example. So I became slightly obsessed with identifying these terms and the overall idea that most of us regardless of who we are and what we do feel the need to be identified by a term of some sort– a vegan, a trannie, a veteran–whatever it is by choice or by nature. To make your own film, is a very entrepreneurial effort. How did you raise funds, find the actors and crew to make it happen? I’ve had a feature film script They Call Me Jack ready for production now for almost two years without funding. As I approached production companies with it they recommended that first I make a short film that represented my style as a writer/director. I was lucky to have a great team of people around me already involved in the feature script so we decided to go full throttle with this film, and we got two private investors to fund the picture. Making a film is extremely expensive, even if the costs have gone down with digital filmmaking I did not want to compromise on the talent nor the set design and the overall quality of the film, so every aspect of the industry has to be paid respect to in order to achieve something you can feel proud of in the end. My Casting Director, Tiandra Gayle set up three days of auditions and we received hundreds of submissions for the roles. In the end we ended up with some great experienced actors–Lori Tann Chinn, Zuzana Stivinova and Scott Speiser. It wasn’t until our first table read when I looked around the room and saw 30 plus people with the script in their hands that I realized how much support I had behind me on this production. To have a cinematographer, a first and second assistant director, original wardrobe, an art director and so forth bring to life the story that you have created is an amazing feeling. You work with several other AMDA alumni in the film. Tell us about why you chose to do that? Yes, I worked with Lauryn Rochelle Garza and Jamie Neumann, both of my graduation year at AMDA. The three of us have remained friends throughout the years and Lauryn and I actually started a production company together called IDA Productions. Choosing Lauryn as my Art Director/ Set Designer was easy, as she has an impeccable eye for details and unique textures and colors. I could not have been more pleased with her work on the film, and we are currently working on a script together in Bangkok, Thailand. Jamie and I sat together in her car one day two years ago and decided that we would take matters into our own hands and make a damn film, so we started writing, and after a long journey we had a feature film script in our hands They Call Me Jack. Since Jack is still in pre-production I decided to intertwine that character into the ending of Miss D. The short film is completely detached from the feature but in the end the two main characters pass each other on the street, smile and offer the audience a chance to wonder what’s to come. Jamie Neumann is Jack, in the story of a hermaphrodite poet struggling with the angst of a series of unrequited loves. Set in the 1990’s New York City during an era of opulent high society and drug-induced artistic expressionism. Once the film was made, what did you do next to market it and get it seen? Once it was finished, my producer and I sat down to choose which festivals we thought would be a good fit for the film and where we thought we actually stood a chance of getting in. This still remains to see. Most of the festival submissions we have made are due in the fall. Did your film play at any other festivals prior to Cannes, or will this be the festival debut? No, we have not yet entered into any other festivals but the SFC at Cannes. What did it feel like to get a letter that said MISS D was going to the Short Film Corner at Cannes? I was super excited, the Short Film Corner is not a part of the Short Film Competition at Cannes but our film amongst many others from all over the world will be on display at the festival grounds for ten days, and we get to be apart of the most amazing industry event of the year. What more could we ask for at this point? What is up next for you? What goals do you have for the future? First off I have my mind set on producing the feature film in 2013 once we secure some investors. After that, I have many little ideas nesting in my head. As far as the future goes, who knows? I do know that I feel secure and confident that I am finally on the right career path for me. Thank you for sharing your insight with us Stefan! Good luck at Cannes. We look forward to seeing what happens with MISS D and beyond.